Welcome to CPRE’s interactive maps of England’s light pollution and dark skies, where you can find out more about our work and how you can help. There are a variety of ways that you can use the interactive map, which is underpinned by Open Street Map and World Imagery satellite maps. 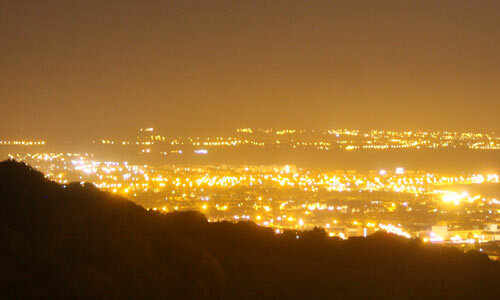 Light pollution is a generic term referring to artificial light which shines where it is neither wanted nor needed. In this section you’ll find CPRE’s report, our editable leaflet, lesson plans and the background report by LUC. How far do you have to go to find a truly dark sky? Is your neighbourhood surrounded by bright lights that are on throughout the night? Or do you work for a local or county council that can influence lighting, either through planning policies or the management of street lighting? Whatever your reason for visiting this site, welcome to CPRE’s maps of Britain’s light pollution and dark skies: the most detailed national maps on this subject created for Britain. CPRE has long been a leading voice in the campaign against light pollution. We’re concerned that, even in the depths of the countryside, genuine dark starry nights are becoming harder to find. 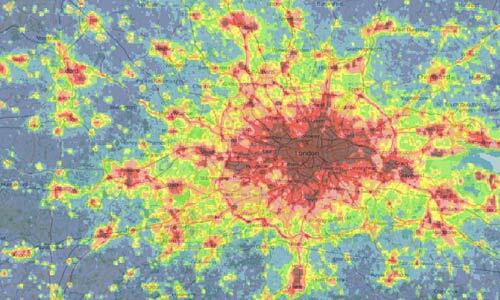 So we commissioned new maps to find out how light pollution is distributed around the country and where the darkest skies are. Our interactive map shows how much light is spilling up into the night sky across Britain, with detailed maps of England’s counties, districts, National Parks, Areas of Outstanding Natural Beauty (AONBs) and National Character Areas. You can also generate a map based on a postcode area. All of the maps can be printed easily, too, helping you to understand where the brightest and darkest places are in your local area. The maps are based on data captured by an American weather satellite in September 2015 that passes over the UK at 1.30 am. We worked with LUC who analysed the data and created these ground-breaking maps. Find your nearest dark skies, to escape from nearby light pollution and experience a truly dark starry night sky. Help local highway authorities to identify where light pollution is a problem and to investigate how it can be reduced, such as via dimming schemes or installing new street lights that focus light downward. Encourage local councils to adopt a lighting policy which will ensure that existing dark skies are protected and that new developments do not increase local light pollution. Identify motorways and trunk roads which emit high levels of light pollution so that action can be taken to install better lighting that won’t spill light upwards. Provide evidence to help people shape future developments in their area, so that they either have well-designed lighting schemes or are refused planning permission if they would cause light pollution in existing dark places. Enable dark skies to be protected by providing robust evidence to support bids for official Dark Sky place status, following in the footsteps of the Exmoor, Northumberland and South Downs National Parks.